Today I ran the 48 Ocean Yacht, Outta Hand, out of the Canyon Club Marina. We had absolutely perfect weather today, one of the ones you dream of. Smooth seas with a little bit of swell, and a good eddy to fish in our local canyons. We started with lines in around 6 am when we saw a log floating about 4 miles from the tip of the Spencer. It was hard to believe that there wasn’t a single fish on it! Anyway, we made our way into the tip where we saw our first white that didn’t eat. After pounding out the area we pushed back inshore towards the edge of the 2 degree break in the scattered weed and went 1/4 on white marlin in about 30 minutes. We worked back to the tip where we picked up a single longfin tuna then had a yellowfin and white marlin at the same time. 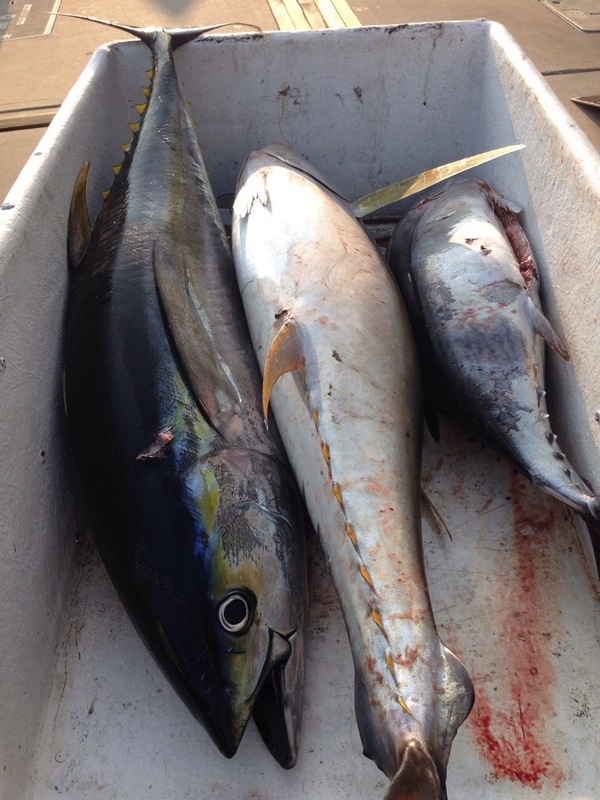 The yellowfin went right around 50 pounds. It was quiet for a bit mid day until we had a white marlin up that we unfortunately missed. Major bummer but we kept working at it and got hooked into a really nice 70# class yellowfin to round out the day. Really fun day offshore on the Outta Hand with a boat full of fun crew! Saturday we made the run down towards the Olinda where I believed the leading edge of the eddy we had been fishing would be. Sure enough, we get there and there was a weedline with a 1 degree break. Water was blue green and 76 degrees on the inside and blue and 77 on the outside full of thickly scattered weed to the point where it was unfishable. Our day started watching a few whites get caught around us, but we could not get a bite. Finally our opportunity came when a 300# blue came in and ate my bridge rod. After a quick feed he was on and peeled 2/3 of the spool in seconds. As we were gaining line back the leader popped and we lost him. Huge disappointment. We kept working the area that became a dead zone until finally late in the afternoon we had a white marlin come up for the left teaser then eat the bridge rod. After a quick fight we released that white marlin that was lit up neon blues from the bite to the release. 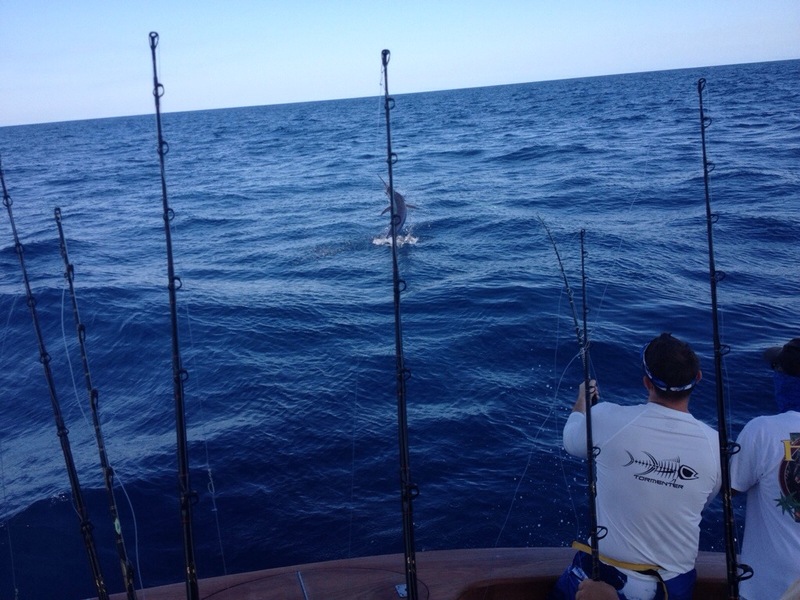 We kept pounding out the area and had tuna skying out of the water for 15 minutes that just wouldn’t bite. We caught quite a few dolphin and had a white come in on the right teaser that just never ate which ended our day. Today I ran the Fin Addict for Day 1 of the Stone Harbor Invitational Marlin tournament. We made the run to the Wilmington and started on the West Wall. We picked at a few dolphin in the blended blue 76 degree water then got our bite! A blue marlin came up on my bridge rod and after a quick 15 minute fight, Marc got the release. After that we pounded the Wilmington a little longer with nothing. With the scattered reports we picked up and ran to the Baltimore to find the leading edge of the water, and we did, 77 degrees and blue with scattered weed. Unfortunately we only had one white come up and look around, but no bite. Back at it tomorrow! I had an 8 hour trip on Justified for flounder on Friday. I was a little nervous that the bite would be slow due to the ground swell, but you don’t know til you go. We started at the Wildwood Reef which was loaded with skates. Only 2 small flounder. After that we ran to the Cape May Reef and picked at a flounder here and there, and managed to get two keepers, one weighing 6.8 lbs. With the slow fishing we ran to an inshore wreck and had no success there then ran to TI Reef and picked at a couple more small flounder but that was it. Slow day of flukin. Mated on the Boss Lady on Thursday for a tuna trip. We ran to the 30 line and had lines in by 545 am. 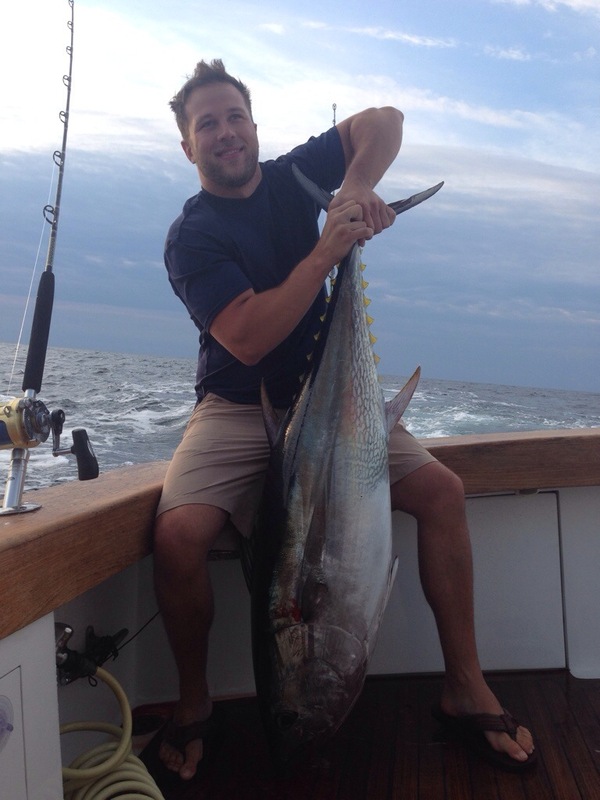 Right away we got a 55″ bluefin tuna on a Squidnation Spreader Bar. After that it was lights out, no bites. Water was 75 degrees and green. Not much bait other then Bonita on the surface. Here is the latest from April and May in Cat Island Bahamas on the 54′ Bertram, Over Under.